Does corporate storytelling work? Some mega-brands say no. With much flourish, Coca-Cola announced in 2011 that it would be moving from “creative excellence to content excellence.” It made an epic, two-part animated video on their strategy, explaining that they would be creating such amazing content that it could not be contained. This thing has spirit, it has soul, it has lots and lots of stories. Check out that navigation bar folks: SPORTS, FOOD, ENTERTAINMENT, HEALTH. Does that sound like a soft drink company website? 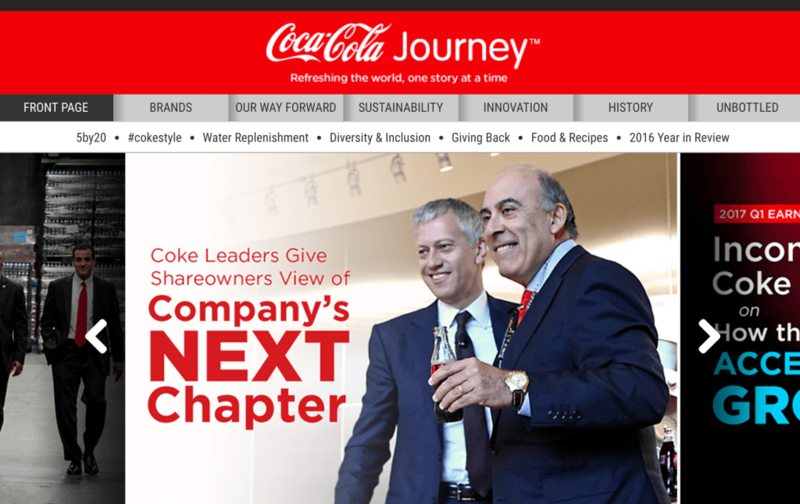 This content site was populated by professional journalists and Coca-Cola Journey represented bold and unconventional corporate storytelling at its best. I’d also like to direct your attention to the item in the upper right corner of the screenshot. This was a post by blogger and entrepreneur Adam Kleinberg disagreeing with Coke’s marketing strategy. Kleinberg told me that he blogged about this topic on his own and then Coke invited him to post the dissenting opinion on the front page of their corporate site. This looks like a regular old corporate website. The sports section is gone … in fact all those cool sections are gone — and the guys in suits are back. This site is so … boring. Where is the storytelling? What happened? In a Digiday post, associate editor Shareen Pathak reported that the big factor in Journey’s storytelling failure was Facebook. First, organic traffic to the Journey site declined precipitously because more people were viewing content on Facebook instead of clicking to websites (I reported on this rise of the newsfeed in an earlier post). The other factor is that with Coke’s buying power, it could create promoted content on social sites more cost-effectively then feeding their own publishing beast with original content. So, they stopped. Is Coca-Cola still a brand publisher? Well, unless you count press releases, not so much. “Journey” is just one in a long line of ambitious corporate storytelling ventures that did not pan out. Another example is Newell Brands‘ Sharpie pen division. Beginning in 2009, Sharpie hosted one of the most beloved and creative content sites in the world. They pioneered user-generated content, featuring entertaining customer stories that ranged from home decorating to high fashion … all with Sharpie pens. Yes, this company found a way to create an excited and engaged community dedicated to pens! The Sharpie blog has not been updated since 2013. The amazing content team was disbanded and the social media accounts were mothballed about the same time. Sharpie had done everything right with an epic content marketing program … and then abruptly ended years of value they had built in storytelling and passionate fans. What’s going on here? And then there was the biggest blow of all. One of the most celebrated content marketing case studies in history starred Fiskars scissors. The awesome Brains On Fire Agency created a global community scrapbookers for the Fiskars brand, driven by a user-generated blog, case studies, and craft projects. The company was able to cite a dramatic increase in awareness, audience, brand loyalty, and sales due to the energetic content site. If there was ever an iconic content marketing case study, this was it … and yet, remarkably the whole thing has been dismantled, piece by piece. The beginning of the end goes something like this: the internal champion of the program left the company to pursue other opportunities. And when that happened, things began to change. The program began to be dismantled. The structure of the program – especially the role of the lead ambassadors, devolved from four, to one, who is now more of a community manager instead of a true lead ambassador. Originally, the leads were encouraged to talk about anything that was going on in their lives. Now? It’s all about crafting and products, causing it to blend in to the noise. The biggest blow to the program came last year, when the decision was made to move away from the dedicated online community platform to just a blog (with no comments) and a Facebook page. So gone are the threaded forums with members issuing fun challenges to one another or doing random acts of crafting. Gone are the thousands of uploaded images of beautiful crafts that capture amazing memories of the members lives. Gone is the assigning of your unique Fiskateer number or the special one-of-a-kind pair of scissors that you receive in the mail and cherish as a member. To be honest, everything that made the program special is no more. Sad … but not unusual. Another example of culture killing a great content program occurred a few years ago at a giant telecom I was assisting. This company was a perfect case study for content marketing done right. They built an internal content program patiently and organically. They had state of the art technology, the understanding and support of marketing leadership, an expanding audience, and “hockey stick” metrics. After a corporate reorganization, the department was re-assigned to a new VP and within six weeks the entire program was killed. The new leader grew up in the era of ads and couldn’t understand what was even happening in the program. 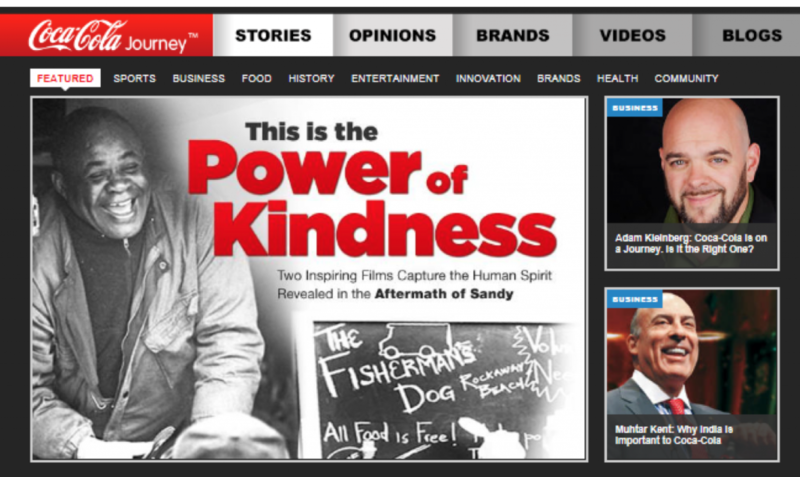 One of the biggest companies on earth turned its back on content marketing. There’s a tendency in our field to market to marketers. We gush enthusiastically for content, for social media, for brand publishing, for community, for squishy stuff like “engagement.” Maybe we’re even afraid not to play along and gush. But as you’ve seen today, sometimes even the biggest and most successful brands who are throwing everything at their “story” can’t make it work. Is it any wonder you’re having trouble doing this for your company, non-profit, or university? Is brand storytelling just a bad idea? Unless you really are a publisher, your business isn’t about publishing content. It’s about your business. We see how Coke drank the Kool-Aid (actually that’s a funny image) and they really did try to be a publisher. But in this case, it didn’t work because who wants to come to Coke for the latest news on sports, entertainment, or fashion? Leave that to ESPN and Vogue. Coke needs to be about Coke, which is more than enough. My advice is, don’t think like a publisher. Think like a marketer. The world has changed a lot in the past two years. If you’re still doing the same content marketing you did 24 months ago, you need to look up and see the new world. People want content in a newsfeed. The inbound marketing model where scintillating content attracts customers to your site like a magnet is becoming increasingly mythical. Most people don’t know this but I have a graduate degree in organizational development. So I look at consulting assignments from a holistic perspective. When I work on a marketing strategy, I consider the company’s history, politics, and bureaucracy as well as the competitive environment. But even I was surprised when the new telecomm VP destroyed years of content success in a matter of days. Just goes to show that if the leader doesn’t get it, it doesn’t get done. There is no such thing as a grassroots cultural change. Embracing a content strategy has to come from the top, every time. Changing a corporate culture is no less daunting than walking into France and saying “Hey France, we want you to be Russia now and drink vodka.” Tough to do. Now please folks, don’t go tweet the world that Schaefer said content marketing is dead. I’m not saying anything is dead. I’m simply encouraging you to rationally consider why some iconic programs are failing, why the new realities of content distribution mean a lot to your business, and why this whole idea of “thinking like a publisher” without considering the end goal is a little crazy.